One of the major concerns if you are the caregiver for someone, who is elderly, is insuring their safety. The news of is full of stories of seniors who fall, or suffer some other problem, and are not found for hours or even days. Today there is no need for that to happen. Whether you are the live-in caregiver for a senior, or a concerned child, or friend of one, there are tools that can help the elderly continue to live an independent life with the safety and security of knowing that help is always readily available. Whether your senior is healthy and just needs some security, or you are caring for an elderly person who is suffering from the effects of aging or disease, there is a tool that can help you provide security and peace of mind. There are alarm systems that range from the simple to the more complex. For simple help-You can choose the most low tech solutions for an alarm. A simple hand rung bell can alert you if the elderly person in your home requires help. Many seniors prefer this type of alarm if they require some kind of in-home assistance. For active seniors-Many elderly can continue to live independent lives, but may want some monitoring should a problem come up. The risks of falling, and sustaining serious injury, and being unable to get to the phone are a major concern when considering the care of loved one. An alarm system can take some of the worry away. An alert can be put in place that allows your elderly loved one to speak directly to a 911 operator, from anywhere in the home. Best of all there is no activation or monthly fees. The pendant on the base will cover up to 600 feet of free space and works well even in large homes. The base and the pendant are simply plugged into a phone line and can begin working right away. 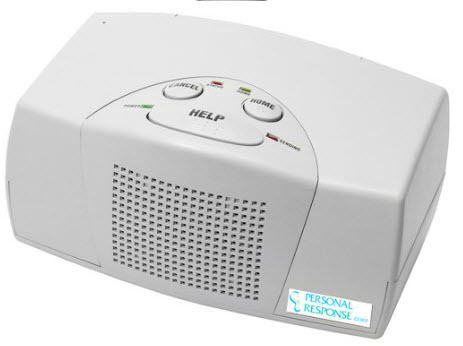 At Caregiverpartnership.com they offer this product along with other types of alarms and alerts, for the safety and security of your elderly loved one. For those requiring more monitoring-There are a variety of alarms that can be used bedside, in the bathroom, or throughout the home, to alert caregivers of a problem. These alarms can also be used if the senior is living in a facility, and most come with different tones so that personal alarms can be distinguished from the facilities. This type of alarm helps monitor the senior who is at most risk of falling, or having a problem. For the bed bound elderly-There is a sensor pad that can be placed in the bed if your loved one is attempting to get up, the alarm then goes off and in-house caregivers can be alerted. It is ideal for caregivers who are watching over a loved one who is dizzy or disoriented. This type of alarm works as a pressure sensitive pad that goes across the width of the mattress. It is placed under your loved one and if they try to get up, a pressure sensor then responds, and provides a warning signal. This type of alarm can be crucial in reducing the risk of falling as many seniors who are dizzy or disoriented may try to get up without assistance and then slip and fall. At The CareGiver Partnership, they offer a disposable bed pad sensor to help you watch over your elderly loved on, who may require bedside assistance. I really like this 911 emergency service you can phone from anywhere in the house, I think it's vital. My elderly mom battles to breath sometimes yet still loves to play bowls, likes to go to art classes and see her friends, so the only emergency help we can get her if she needs it is when she is out of the house is to give her a cheap little Tracfone especially for seniors (its the Samsung T155G), with the big buttons, big letters and it's hearing aid compatible and only costs her $6.66/month. At least if mom feels she's having a breathing attack she can phone me or phone the 911 emergency locate assist on her phone to get help sent to her right away. She keeps the phone around her neck at all times when she's out. Nice post. You need to consider these tips if you want to make your family happy with your monitoring system. Senior citizens do not want to depend on the family. So its better to use medical alarm system in old age to remain independent. I couldn't agree more with the comments. I like the added protection that Philips Lifeline offers - with AutoAlert fall detection. For just a little bit more a month, you and your loved one gets the extra piece of mind knowing that if they fall, an alert will go out automatically. We've been studying all the different options for a couple of years now.